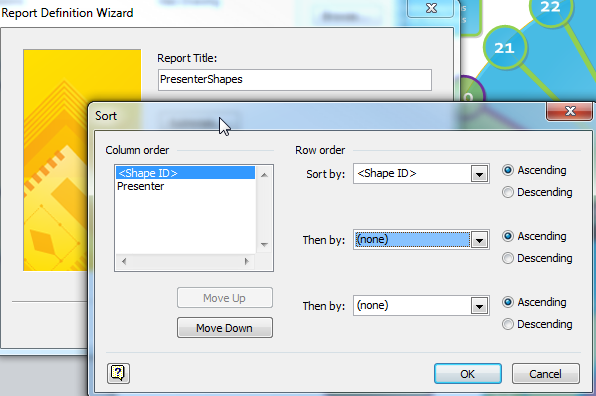 A Visio user recently asked if it is possible to assign shapes to layers from a list. 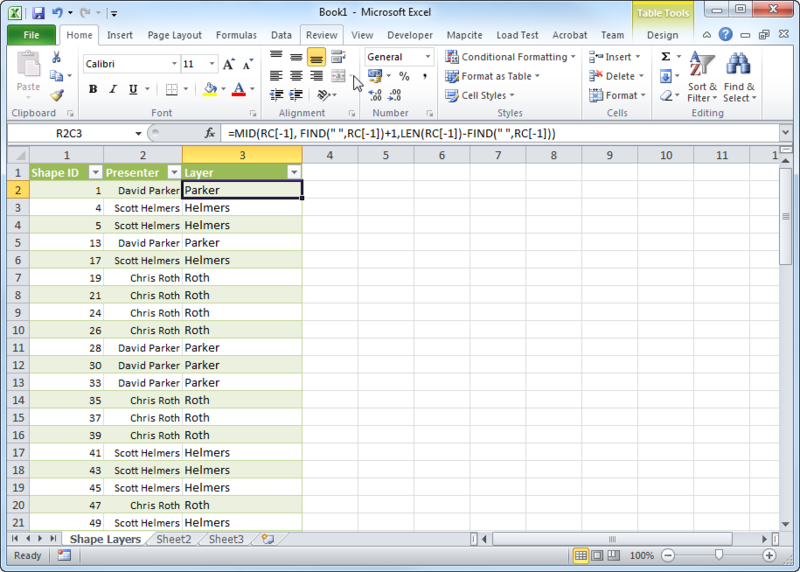 In his case, he has an Excel table which he has exported shapes and their text using Visio’s Shape Reports feature, to which he has added a column named Layer, and he wants to assign the shapes to these layers. In this article, I demonstrate how this can be done. 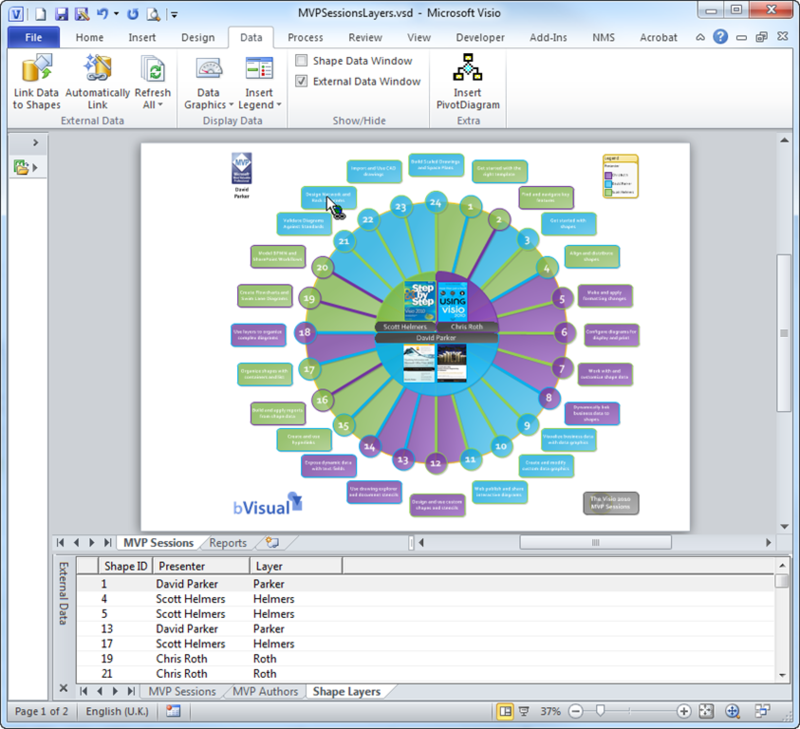 I decided to use my MVP Session Wheel diagram ( see https://blog.bvisual.net/2012/06/29/mvp-sessions-wheel/ ) for this example because it already has some layers assigned. This is just so that I could quickly name some layer for each row. 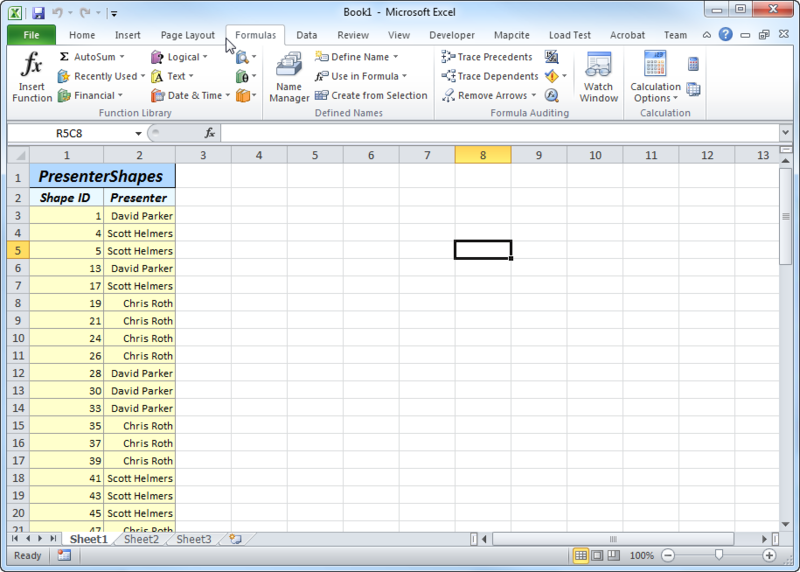 I saved the workbook then I then, in Visio, used the Link Data to Shapes feature to add this table as External Data. Finally, I had everything in place to write some VBA code. First I created two support functions that could tell me if a specified shape or layer exits on a specified page. 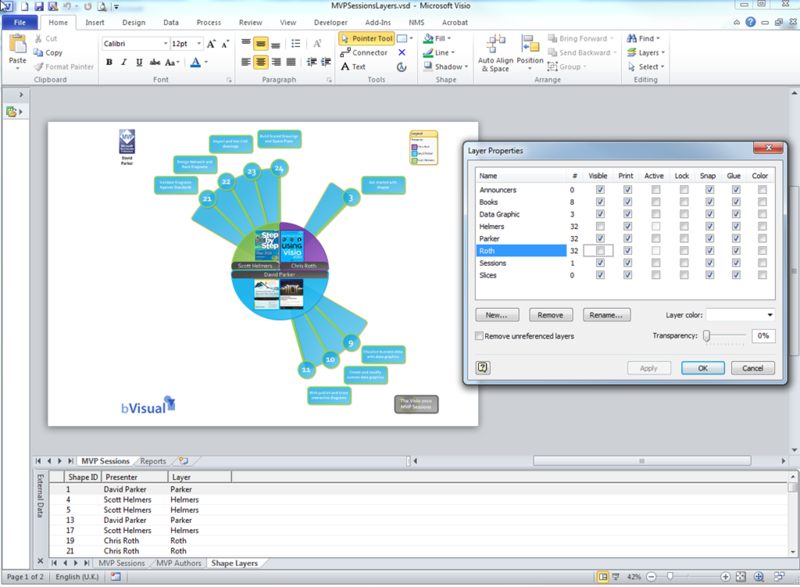 (It would be so useful if similar functions were already in the Visio Type Library). Next I wrote the main sub routine, AssignLayers(), which requires the selected recordset in the External Data window to have two particular columns, Shape ID and Layer. It uses the data in these columns to assign the shapes to the layer, but of course, it must add the layer to the page, if it doesn’t exist already. Also, remember that Visio shapes can be assigned to zero, one or many layers, so the routine also asks whether you want to replace any existing layer assignments or just to add to them. MsgBox "There is no active DataRecordset", vbExclamation, "Assign Layers"
MsgBox "There is no Shape ID column", vbExclamation, "Assign Layers"
MsgBox "There is no Layer column", vbExclamation, "Assign Layers"
You may note that de-assigning and assigning shapes to layers in Visio is a little unintuitive because you have to get the page layer object and either remove or add the shape to it. Also note that I have used zero as the second parameter to the layer.Add(…) and layer.Remove(…) methods. This ensures that the layer assignment is propagated to any sub-shapes. The end result is that I can assign shapes to layers, and then I could switch off the visibility of Chris’s and Scott’s MVP sessions ! Of course, I wouldn’t recommend that you do switch their sessions off, because they are all gems ! Thanks for this (3 years later)! I had created a huge flowchart only to realize I need to change some specific shapes but forgot to assign layers. Would take forever to assign manually. However, two types of shapes that were previously grouped (which I ungrouped for this function) would not apply. Not sure why. If you’re still monitoring this maybe I could send you my file and you could take a look? Sure, send me the file, or a OneDrive link, but I warn you that ungrouping a master instance is not normally a good idea…. Actually, I think I know what the deal was. These shapes that weren’t assigned were pulled from some Visio templates and I realized they had lots of custom formatting settings in the shapesheet. These were preventing me from even re-aligning the damn things. I got it sorted, so no worries. I highly doubt it was your code. Hello, Interesting feature. I have a complex problem and perhaps could you give me some advice to solve it. I want to import data for different connectors between shapes. For each connector I have several values and I want to add each value to a specific layer. To be more pratical I want to create a flowsheet describing substances pathways between units so data are linked to connections between units. I want to create for each substance a specific layer and to add the values corresponding to one substance to the specific layer of the substance. The Shape Data row visibility could be controlled by layer visibility, although one has to be mindful that layer indexes could be different on other pages. However, you are possibly thinking of the display of the values? If so, then you would need to turn your connectors into group shapes with multiple text blocks on different layers. 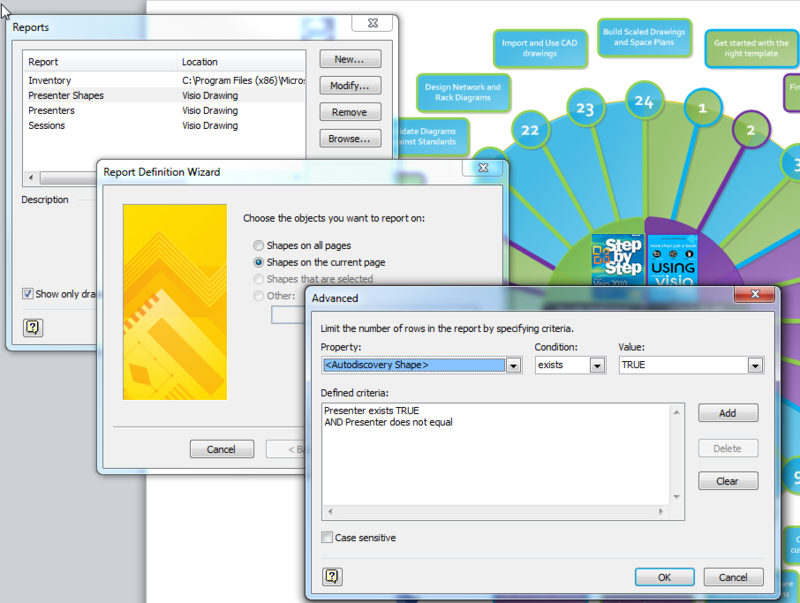 Then their display can be controlled by layer visibility. I’ve recently found your website and keep coming back to it every time I google a visio related question, it’s such a great resource and you have a way of explaining things really clearly. This post looks to do exactly what I’m after, but I was wondering if you had a post somewhere you could link to that explains the starting steps of getting to the point I could enter this vba code as it’s not something i’m familiar with.